That is brilliant, and damnit if it isn't how I see Mara in my head too! Thanks! It's nice to hear that my vision of Mara gells with others'. :~) Glad you enjoyed the pic! Hee! I was going to say "While I don't like Mara ... blah, blah, blah ... "
But I'd be lying. I hate Mara too. Still -- this is beautiful! I love the colours -- and Luke's eyes are really amazing. So much emotion there. Very sweet! I really like how the colors blend, and of course, the hair is beautiful! 22nd-Jan-2006 06:26 am (UTC) - Wow!! First off, how can you hate Mara?!?!?! I LOVE Mara! She totally rox! And Kate, you have captured her perfectly here! And thank you for not making Luke a "blond" blond. Where do all these fan artists get the idea that Luke is a perfect blond? He's not. Dark blond, I'll give you, but true blond? Nope. Not since he was a teenager. I love the look on Luke's face the best, I think. And the slightly possesive gesture of his hand on her back speaks volumes. Totally cool. 22nd-Jan-2006 12:10 pm (UTC) - Re: Wow!! First off, how can you hate Mara?!?!?! You do not want to send me off on a Mara rant. Believe me. That is done in color pencils?! O__O! This is absolutely amazing Leela. I love how soft and flowy the whole piece is and the way you used the strokes too. Gods....I miss working with my pencils and pastels too. New SW art!! Be still my heart! Even with Luke and Mara, it's still sooo cool to see new stuff from you in this fandom. p.s. 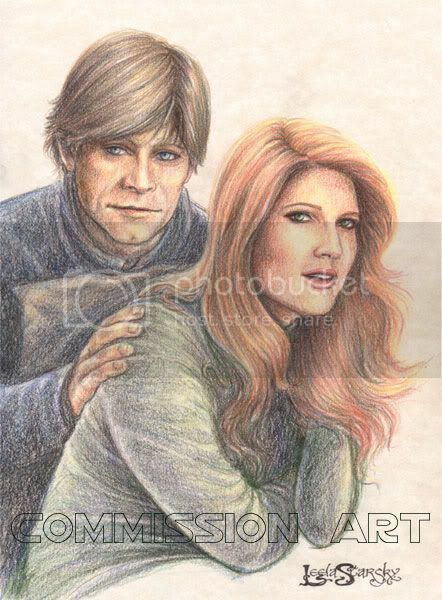 I don't suppose there's anyone nagging you for Han/Leia art, is there? I'd love to see them again. "I'd love to see them again." --Like they're old friends. Listen to me. I think I just crossed the border into psychoville. This is really a beautiful piece, Leela. I think the softness of the pencil made it the perfect tool. Your interpretation of Mara is very much genuine; she is human, flawed, imperfect, not gorgeous, and portrayed here as a character I would like to get to know. Your Luke, of course, is wonderful. You got everything right: the size of his hands, the lightness of his eyes belying his age here, the bits of silver in his hair, and hers as well....I love this. Was there a story this was to be connected to? I'm so glad to hear you liked my rendition of Luke, Sue! I tried to make him a little older than he was in Jedi, yet not as old as Mark looks now. This is great! I love how old Luke's eyes are here. It's perfect, and Mara is beautiful, just how I pictured her in the New Jedi Order series. so pretty ful!!! i envy ur skills!